One of the biggest challenges we’re facing in the fight to stop the anti-democratic Trans-Pacific Partnership (TPP) agreement is that too many people still don’t know what it is. That’s a real problem. And corporate lobbyists are hoping to exploit it to quietly rush the TPP through Congress this Fall. 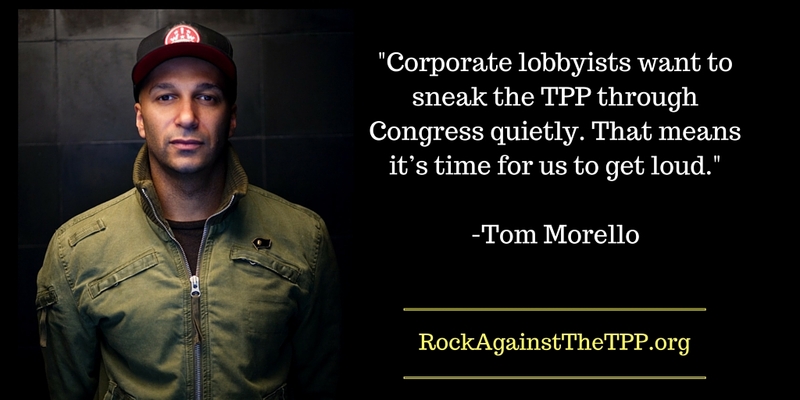 Fortunately, we’ve got a secret weapon to help sound the alarm: the “Rock Against the TPP” roadshow. Click here to take action and learn more! There will be a free concert in Denver, at Summit Music Hall on Saturday, July 23rd, to mobilize opposition to the Trans-Pacific Partnership (TPP) agreement. 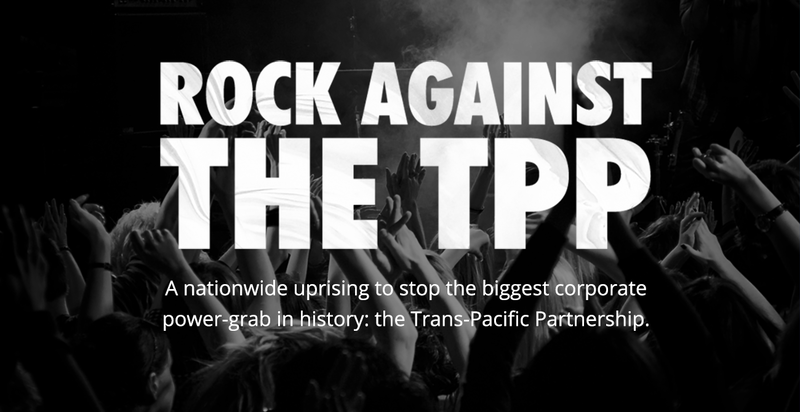 This concert will kick off a national tour called the “Rock Against the TPP” roadshow. 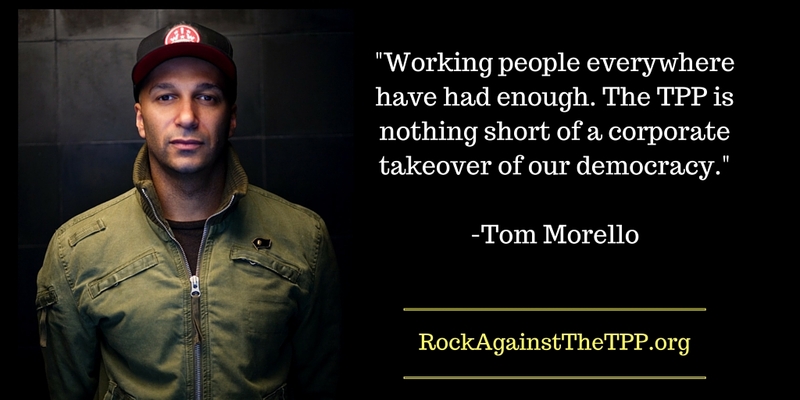 The concerts will feature Tom Morello (Prophets of Rage, Rage Against the Machine, Audioslave), popular punk band Anti-Flag, Golden Globe nominated actress Evangeline Lilly (Lost, The Hobbit, Ant-Man), Denver-based hip-hop outfit Flobots, and buzzworthy bi-lingual rockers Downtown Boys. Additional performers for the Denver kick-off include Firebrand Records artists Ryan Harvey, Lia Rose, and Son of Nun, Puerto Rican vocalist Taina Asili, and riot-folk singer / Fight for the Future campaign director Evan Greer, the tour’s lead organizer. Speakers from a broad coalition of organizations opposing the TPP will address the crowd, explaining the many dangers posed by the agreement. Tour Kick-Off July 23-24, Denver, CO — All ages. Free! See a full lineup and Rock Against the TPP tour dates here: RockAgainstTheTPP.org. Also visit Fight For the Future. 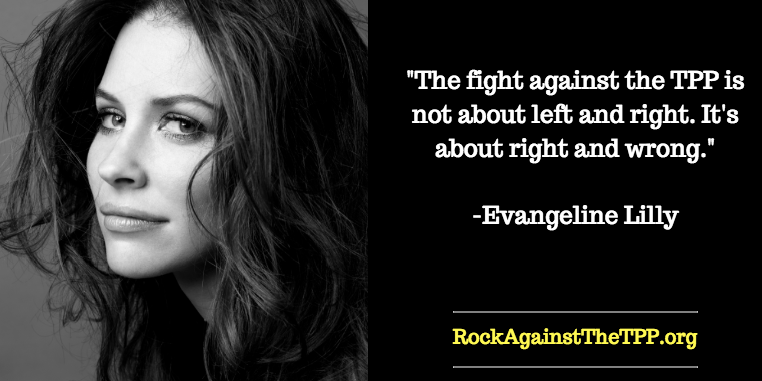 BREAKING: Celebrities like Tom Morello of Rage Against the Machine and actress Evangeline Lilly are joining forces to Rock Against the TPP and stop the anti-democratic Trans-Pacific Partnership agreement.